I’ve talked about this before. One of the projects I’m involved with at work is adding metadata to a collection of photographs by Frank Hohenberger. It’s fun! And I occasionally blog about some of the photos I’m working on. There are two photos in the collection of praise houses. Only Hohenberger called them “prayer houses,” and his titles are sacrosanct, so we can’t edit them. 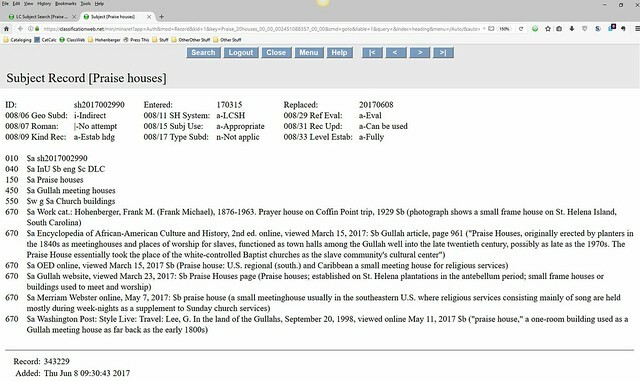 We also couldn’t add a subject heading for “praise houses,” because the term did not exist in either the Library of Congress subject authority file or the Thesaurus for Graphic Materials subject list, and we can only pull terms from those two sources. Maybe that doesn’t seem like a big deal. The terms praise house and prayer house sound fairly similar, right? So people could find the praise house images by just doing a keyword search. But it is a big deal. Praise houses are a very specific, unique thing, and no one who is searching for praise houses will think to search for prayer houses, instead. So without being able to add a subject for praise houses, a keyword search for the term won’t work (our keyword search is literal and cannot understand that prayer and praise are synonymous-ish). That means that these images, which might be of interest to folks studying African American history or the Gullah people, would not be findable. They were basically hidden from view. So I’ve nagged and nagged and nagged, over the course of the last 5-6 years (yes, really), until I finally was able to hash out a plan of action with a SACO cataloger. I gave her all my research on praise houses, and last February, she started working on submitting a proposal to LC for a new praise houses subject heading. We didn’t expect it to pass on the first round, but it did, and it is now live. This may seem kind of wonk-ish and boring, but it is a big deal to me, personally. This one was a puzzle. A fun puzzle. From Hohenberger’s title, I knew Mrs. Knapp’s neighbors were the Deam family. One of the preceding photos in the set was of someone Hohenberger identified as Alberta Deam. Another photo showed an interior from the Deam home, with cabinets full of stacked papers and an open botanical specimen displayed on a desk. Knowing what I do of Hohenberger, the study likely belonged to a locally important botanist. So I searched for botanists named Deam and came up with Charles Deam. From there, I was able to figure out that the family was living in Indianapolis at the time of the 1910 census and that the daughter Hohenberger photographed was named Roberta. This photo was taken in 1913, so there was a good chance the Deams and Mrs. Knapp were neighbors in 1910. And they were. I found Mrs. Knapp listed in the 1910 census, living at 304 Burgess Avenue. The Deams lived at 318 Burgess Avenue. The 1913 city directory for Indianapolis confirms that both families were living in the same homes in that year. So with that, I give you Mrs. Sarah Ann Knapp, neé Goodwin, born 5 April 1831 and died 19 March 1915. This photo was taken, then, just two years before her death. I’m delighted that I was able to properly identify her. It would have haunted me if I hadn’t. I mean, just look at that face! She is fabulous. And I’ve no doubt she’d be more than capable of haunting anyone she pleased. I spent some time today working on cataloging more Frank Hohenberger photos. This was one of them. I adore everything about it. Library of Congress also has some nice photos of the arch, as part of the HABS/HAER collection. Part of my job (a too small part, but I’m a little biased) involves working on adding metadata to the Frank Hohenberger photo collection. I have lamented and complained and whined that there is not a good way to blog about these images, because some of them are quite wonderful. But it just occurred to me that the “press this” bookmarklet might be the perfect solution. So, I give you one of the first images I cataloged: Jennie Smith sitting on her porch in Barbourville, Kentucky, smoking a corncob pipe, taken by Hohenberger in 1933. I love everything about this photo. 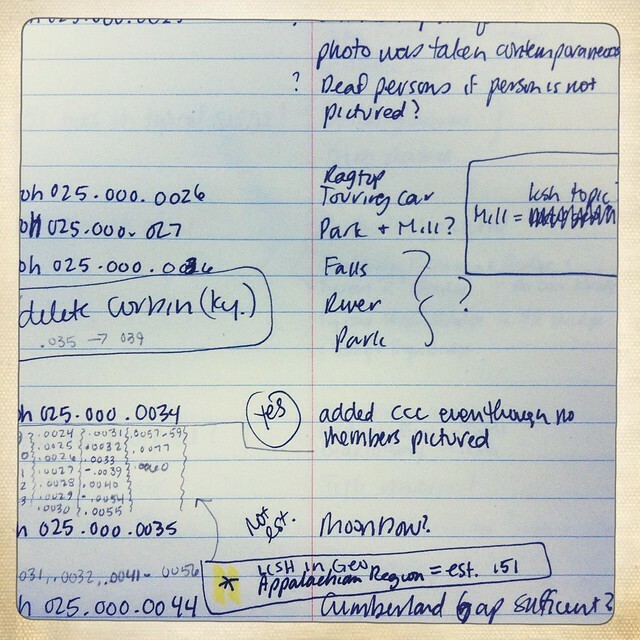 Notes from working on the Hohenberger photo project. I’m starting a fun project at work, adding metadata to a collection of old photographs by Frank M. Hohenberger. The bulk of the photos were taken in this area, so they’re of local historical interest. I couldn’t resist searching for cemeteries and graves, and when I did, this one jumped out at me. The “title” comes directly from Hohenberger’s journals, so we have only him to blame for the fact that William Couper‘s wives were only significant for the fact that they were married to him. They apparently did not merit their own names. And look at how young they were when they died! Hellenea was 28 and Pamellia just 23.